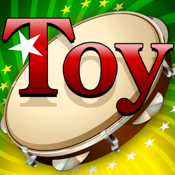 This is a musical instrument inspired by the Brazilian tambourine "pandeiro". Check the demo movie on Support Page. * Gyro sensor is required. It is supported by the fourth-generation iPod touch and the iPhone after the iPhone 4. - Trace the screen to make a finger roll sound. Take it easy and enjoy shaking and hitting the app. Special introductory sale for the following apps. * Please be careful not to drop the iPhone/iPod touch while shaking it.